One of my OH’s conditions for me getting my beautiful puppy was that we would have ‘curry Sundays’ which to be fair, we have mostly stuck too (with the exception of last night!). 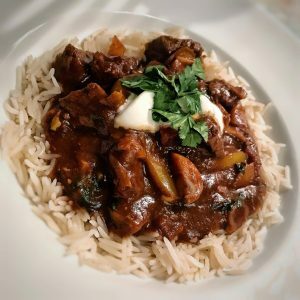 Last week, in an effort to keep things interesting, I whipped together this lovely curry and I have to say, it may be my favourite curry creation yet. I cooked this on a low simmer for an hour so the sauce was lovely and rich and the beef lovely and soft and falling apart. If you don’t have time to do this however, just pop it on a higher heat for anywhere from 15 minutes. Remember to adjust the level of chilli to your taste here. We like things hot so we added fresh chilli at the end but without the fresh chilli it has a lovely underlying warm heat. This curry is a real treat and for only 2 sp per portion, people will never believe this is a diet friendly meal. I served this with 60g basmati rice (6sp) and a large dollop of fat free yoghurt (0sp) so the meal was a grand total of 8sp. An absolute bargain points wise. Careful to add the points for your chosen amount of rice! If you are in a rush you don’t necessarily need to remove the beef and then the veg from the pan as you go. If you have time though it really is worth it as the beef ends up melting in the mouth! Heat a large saucepan to a medium heat and pop in the cumin and coriander for around 30 seconds until they start to toast and pop and you can smell the lovely aromas. Remove from the pan and pop in a pestle and mortar and grind to a fine powder. Add the garlic and ginger and mash to a pulp and then add the rest of the paste ingredients with one tbsp. water and combine into a paste. Pop to one side. Spray the same large saucepan with 1kal and then add the beef, seasoning to taste, and fry for a few minutes until the outside is sealed. Remove the beef from the pan and pop into a bowl to one side. Add the onions and fry for a few minutes and then add the peppers and mushrooms. Fry for a few minutes until the pepper starts to soften. Remove the veg from the pan into another bowl. Spray the pan with 1kal again and add the curry paste to the pan with enough water to loosen it a little. Fry for a minute or two and then add the beef back to the pan, coating well in the paste. Add the veg back to the pan with the tomato puree and fry for another minutes and then add the stock cube and tin of tomatoes. Fill the empty tin with boiling water and add to the pan and stir to combine everything. Turn the heat down to low and then cover and simmer for 1 hour (if you would like to cook the curry for less time, turn the heat up a little). Take the cover off for the last 15 minutes to thicken the sauce. If the sauce won’t thicken, mix 1 tsp corn flour into a little cold water making a paste and pop into the curry. This will thicken it nicely. Finish by stirring through a further tsp of garam masala, fresh chilli and fresh coriander. Season to taste. Remove from the heat and serve with some fluffy white rice and a dollop of fat free natural yoghurt, topped with a little fresh coriander. I was thinking of popping this in my trusty slow cooker. I am cooking a curry banquet for 8 tomorrow so I want to get everything on the go in the morning. Anything I should do differently if I do? Made this last night – absolutely delicious! Can’t believe how low points it is either. Delicious! Had this two nights in a row and could happily have it a third (it actually got even better after a day in the pan). Husband also loved it. Thank you Laura. I feel like this with this one Donna, so glad you both loved it!! Hi, can’t wait to try this tonight! Do u think it could be doubled up and frozen? Going to make this tonight. Got most of the ingredients. Amazing!! Made this when hubby wanted a takeaway it’s so good! So pleased you liked it Jo! Made this tonight and it was gorgeous. Lovely recipe to follow, great making the curry paste from scratch, gutted that the kids liked it as was hoping to have it again tomorrow! Highly recommended. So pleased you all enjoyed it Mark!! First recipe I’ve tried from this site – it was gorgeous and I’ve an extra portion saved in the freezer. I look forward to trying some more . Pasta Alla Nonna tomorrow I think – I’ve a load of aubergines that want eating! Hi there I am looking forward to trying this at the weekend! I just wondered if you could clarify for me what you do with the garlic and ginger as recipe says add garlic and ginger and to a pulp – is there meant to be another word there? Sorry if that’s a dumb question! This is gorgeous! I cook it in my slow cooker and beef just melts! Great flavours! Always aim to freeze left overs but there never are any! !